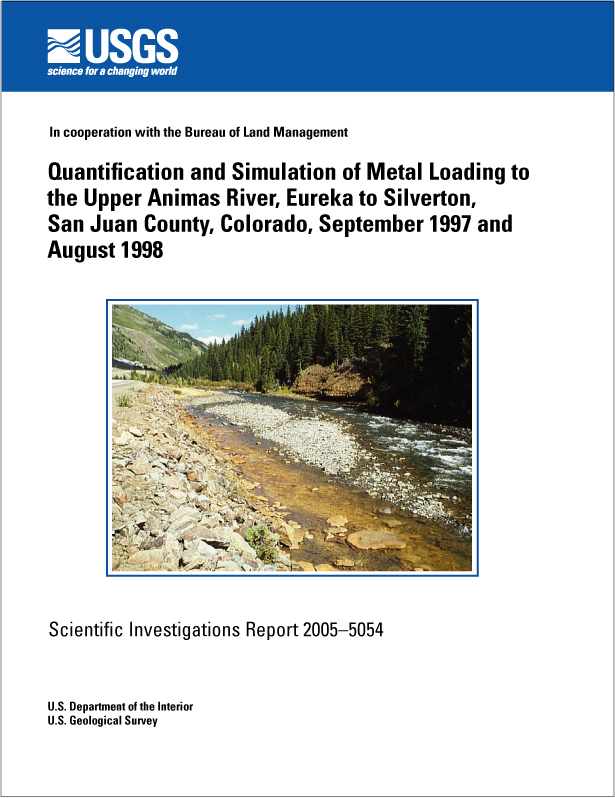 Paschke, S.S., Kimball, B.A., and Runkel, R.L., 2005, Quantification and Simulation of Metal Loading to the Upper Animas River, Eureka to Silverton, San Juan County, Colorado, September 1997 and August 1998: U.S. Geological Survey Scientific Investigations Report 2005-5054, 73 p.
Drainage from abandoned and inactive mines and from naturally mineralized areas in the San Juan Mountains of southern Colorado contributes metals to the upper Animas River near Silverton, Colorado. Tracer-injection studies and associated synoptic sampling were performed along two reaches of the upper Animas River to develop detailed profiles of stream discharge and to locate and quantify sources of metal loading. One tracer-injection study was performed in September 1997 on the Animas River reach from Howardsville to Silverton, and a second study was performed in August 1998 on the stream reach from Eureka to Howardsville. Drainage in the upper Animas River study reaches contributed aluminum, calcium, copper, iron, magnesium, manganese, sulfate, and zinc to the surface-water system in 1997 and 1998. Colloidal aluminum, dissolved copper, and dissolved zinc were attenuated through a braided stream reach downstream from Eureka. Instream dissolved copper concentrations were lower than the State of Colorado acute and chronic toxicity standards downstream from the braided reach to Silverton. Dissolved iron load and concentrations increased downstream from Howardsville and Arrastra Gulch, and colloidal iron remained constant at low concentrations downstream from Howardsville. Instream sulfate concentrations were lower than the U.S. Environmental Protection Agency’s secondary drinking-water standard of 250 milligrams per liter throughout the two study reaches. Elevated zinc concentrations are the primary concern for aquatic life in the upper Animas River. In the 1998 Eureka to Howardsville study, instream dissolved zinc load increased downstream from the Forest Queen mine, the Kittimack tailings, and Howardsville. In the 1997 Howardsville to Silverton study, there were four primary areas where zinc load increased. First, was the increase downstream from Howardsville and abandoned mining sites downstream from the Cunningham Gulch confluence, which also was measured during the 1998 study. The second affected reach was downstream from Arrastra Gulch, where the increase in zinc load seems related to a series of right-bank inflows with low pH Quantification and Simulation of Metal Loading to the Upper Animas River, Eureka to Silverton, San Juan County, Colorado, September 1997 and August 1998By Suzanne S. Paschke, Briant A. Kimball, and Robert L. Runkeland elevated dissolved zinc concentrations. A third increase in zinc load occurred 6,100 meters downstream from the 1997 injection site and may have been from ground-water discharge with elevated zinc concentrations based on mass-loading graphs and the lack of visible inflow in the reach. A fourth but lesser dissolved zinc load increase occurred downstream from tailings near the Lackawanna Mill. Results of the tracer-injection studies and the effects of potential remediation were analyzed using the one- dimensional stream-transport computer code OTIS. Based on simulation results, instream zinc concentrations downstream from the Kittimack tailings to upstream from Arrastra Gulch would approach 0.16 milligram per liter (the upper limit of acute toxicity for some sensitive aquatic species) if zinc inflow concentrations were reduced by 75 percent in the stream reaches receiving inflow from the Forest Queen mine, the Kittimack tailings, and downstream from Howardsville. However, simulated zinc concentrations downstream from Arrastra Gulch were higher than approximately 0.30 milligram per liter due to numerous visible inflows and assumed ground-water discharge with elevated zinc concentrations in the lower part of the study reach. Remediation of discrete visible inflows seems a viable approach to reducing zinc inflow loads to the upper Animas River. Remediation downstream from Arrastra Gulch is more complicated because ground-water discharge with elevated zinc concentrations seems to contribute to the instream zinc load.